American McGee’s Alice in 2000 introduced players to an insane Wonderland, a very dark reinterpretation of Lewis Caroll’s literary classics. Fans that remember playing the original on PC will be glad to know that the same dark, twisted imagery that hallmarked the original is as strong if not more in this sequel which brings back the madness and insanity that is ‘Alice: Madness Returns’. 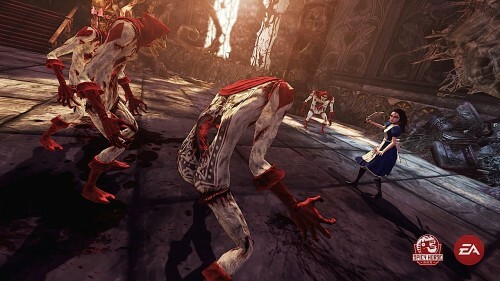 The main allure of this game is its dark and twisted reinterpretation of ‘Alice In Wonderland’. 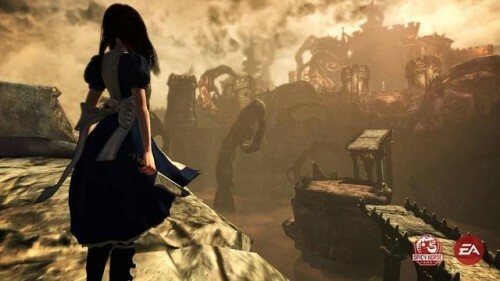 The game takes place eleven years after the events in the first game, with Alice released from the confinement of the insane asylum and now in the care of psychiatrist Doctor Brumby. And still things are not as they seem. Alice is still haunted by the tragic loss of her family in a fire and troubled by gruesome visions of what her ‘Wonderland’ has become. Dragged into Wonderland once again, Alice attempts to piece together her lost and forgotten memories to ultimately figure out what happened that night. The story overall doesn’t really get any deeper than this, and unfortunately it’s bogged down in poor execution. Playing through the game, I felt that the story was very convoluted and very hard to follow at some points; particularly when Alice goes back to the real world from Wonderland. There is very little continuity between these sections and there is little explanation as to why she is there at all. Along with this, the game doesn’t exactly tell you everything about the characters or even why you’re doing what you’re doing, leaving you feeling somewhat left in the dark in some points. However with all this said, there are nice attentions to game’s story, such as the storybook-like animated cut scenes which look really good and adds to the game’s overall unique look and feel. Despite the story lacking in some areas it’s still fairly decent for a game like this. 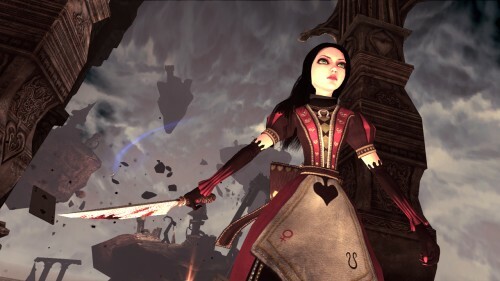 Alice: Madness Returns is at heart, part action and part platformer. Spicy Horse should be congratulated on getting that mix correct in this game. Thanks to good level design, fighting sections and platforming sections are seamlessly woven into one another without that awkward feeling of ‘being set up’ or’ moving through one arena to another’, like you would find in other similar games. Platforming in this game is very solid with well thought out puzzles and level design. However at times it can feel like a grind as you are just running back and forth pulling leavers and flicking switches just to get through an area. 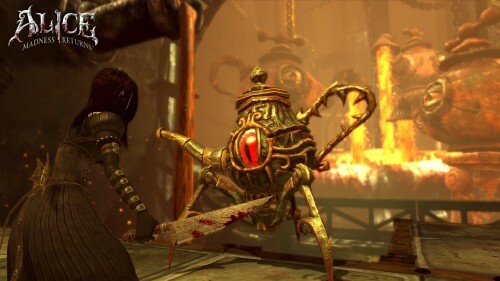 Alice: Madness Returns introduces the ability to shrink anytime within the game. This gives Alice “Shrink Sense” in which she’s is able to see things that would otherwise be hidden. It’s not a gimmicky game mechanic. By shrinking directions, hidden passageways and even invisible platforms are revealed. With that said one good thing about the game are invisible platforms, and one bad thing about the game are invisible platforms. As your shrink sense only last momentarily, these platforms often disappear as your jumping in mid-flight leaving it up to the players to guess where these platforms are. This especially gets frustrating when the game throws at you moving invisible platforms in timed sequences. Spicy Horse has also ditched combo lists in favour for a simplified combat structure. 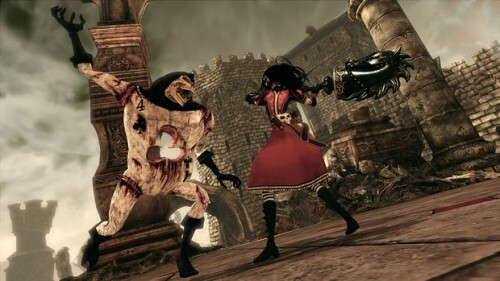 Yet without dumbing-down the attacks to just ‘light and heavy’ or just ‘one-button combat’, Alice: Madness returns retains fast paced, fluid and smooth combat throughout the game. A range of weapons are introduced to players including the Vorpal Blade, Hobby Horse, Pepper Grinder, Tea Pot Cannon and Clockwork Bomb. These weapons are slowly introduced to players as they progress through the game and are often needed in the various platforming sections. The Clockwork Bomb for example acts as a timed weight, which players will need to use to hold pressure pads in place. The game itself is quite lengthy at around 10-15 hours depending on if you want to complete everything in the game, which there is ALOT of. Despite being a linear game, multiple paths can be taken to complete a level. Alongside numerous hidden rooms and secret passages which can be taken to find an assortment of collectables such as memories, bottles and rotunda rooms – which act like special challenge rooms where Alice must either fight wave after wave of different enemy types or complete a range of mini-games. Completing any four of these rooms rewards players an extra health rose and they’re also a good distraction for players from the quest at hand. However with these good points in mind, gameplay in Alice: Madness Returns is not as fully-fledged as it have should be. In combat for example, more often than not players will die simply because they are swamped by too many enemies or boxed in way too much by the locking on system which fix the camera a bit too awkwardly. And in harder sections of the game this gets very frustrating. 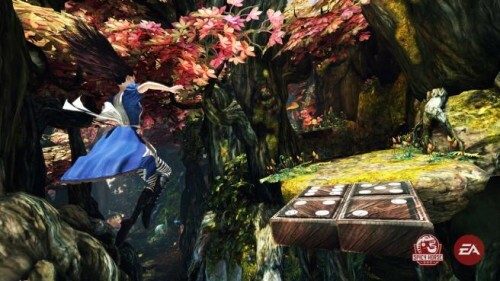 Judging distances in this game is also not perfect, despite the developer’s attempts at fixing this common problem found in many platforming games – Alice has the ability to float and take multiple jumps mid-air. Yet still I found myself falling to my death several times over a platform I swear I could have made. It’s a minor complaint as there is no death penalty for dying in this game whatsoever which may be a bit of a head scratcher, but an even bigger head scratcher is the game’s lack of boss battles. With the expectation of the game’s final boss, there are no real bosses in this game expect for the occasional tougher enemy type. Which felt quite disappointing, game’s first chapter builds up to boss battle yet it’s completely dismissed in a brief cut scene at the end. 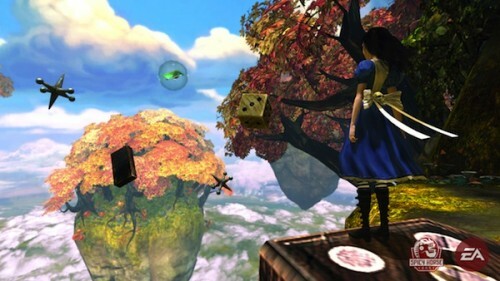 The world of Wonderland is presented superbly through the game’s very strong art direction which all presented effectively a very dark and twisted world. The game shines in the fact that players are drawn into a colourful world which then flipped on its head completely. Players will be traversing through a range of environments from twisted clockwork industrial factory, to a bizarre underwater theatre and to a very, very creepy doll factory (There is a MA15+ rating for a reason…). Graphically the game is presented in a very stylishly cartoony way, which is fitting to the games setting and it works well. Characters models themselves are done quite well and animations are smooth as they should be in a game like this. It’s unfortunate that there is texture pop-ins and other annoying graphical problems which impedes the overall performance of the game. And on top of this, later levels of the game feel overly dark and repetitive with the same dark colours used over and over again. The game definitely has a very memorable soundtrack and hauntingly creepy theme. Which all sets up what players will expect in this game. Voice acting in this game is very good and spot on, especially since you will be picking up various ‘memories’ scatter in the world which plays out like audio logs. 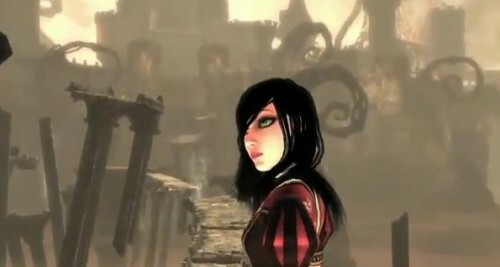 Alice: Madness Returns is a solid platfomer and action game. 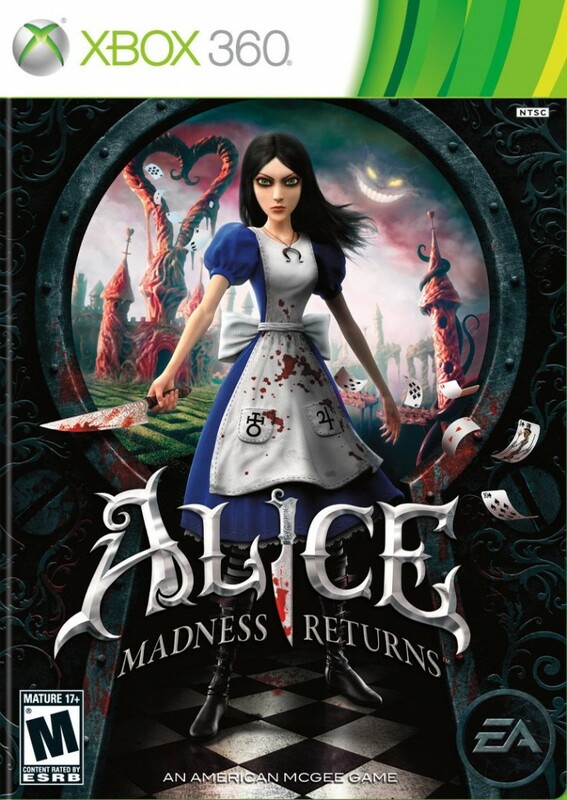 It is a welcome return to the world very dark and twisted world of Wonderland for those who remember it from American McGee’s Alice (which by the way, is included free of charge in each new copy of the game). For a single player action adventure game it’s quite lengthy, perhaps inflated more so then it should be by numerous collectables and extended gameplay sections which too often overstay their welcome. Yet with all the games flaws, there still is quite an adventure to be had in this very twisted and deranged take on ‘Alice In Wonderland’. And for that I’d have to say it’s at least worth the trip down the rabbit hole.